System Administrator are a busy lot and some of them literally run around all day fighting fires on computers no longer connected to anything. Others use remote access to tend to a large number of servers. Or both. 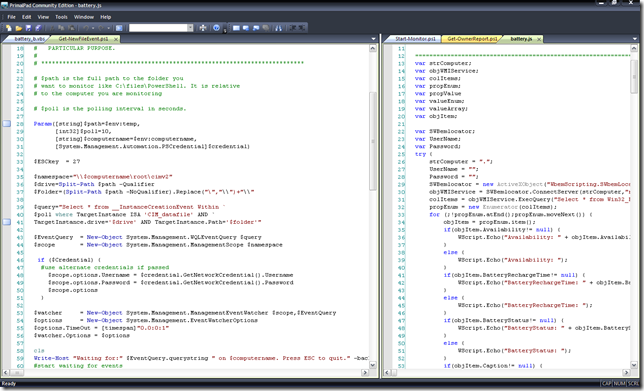 Thanks to scripting, most repetitive tasks are taken care of. But sometimes you need to double check a script at some location or modify something you have, to fit the task at hand. Since you are on the road, literally or virtually, you don’t have PrimalScript with you. Or you just are not supposed to install anything on that particular computer. That is when you usually revert to notepad. Not anymore. 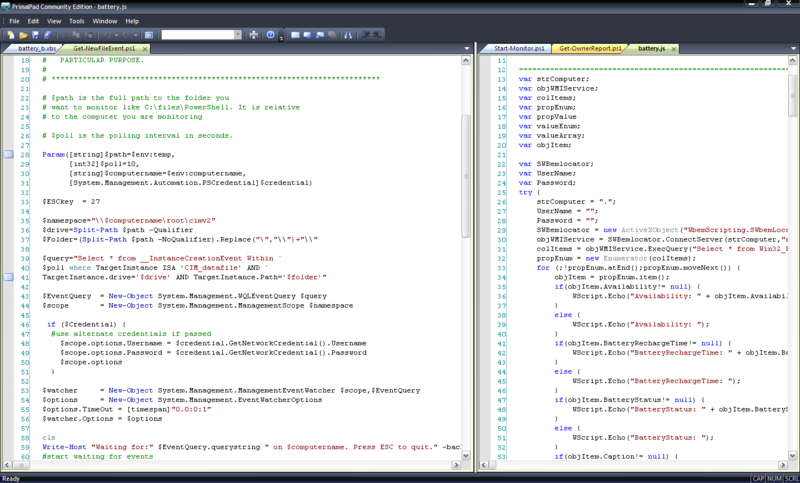 Meet PrimalPad, the single file, color coding editor for VBScript, JScript, HTML and PowerShell. No installation, no dependencies. Just keep it on your thumbdrive and run it wherever you need it. Now for the best thing, it is FREE for personal, educational and non-profit use. Make sure you read the license agreement that pops up when you first start it on any computer. We will have programs for corporate users, co-branded, personalized or fully branded to go with your custom application that needs an editor. Contact us at info@sapien.com with any questions. Your feedback is always welcome, any questions and concerns should be posted at our Community support forum. What is the syntax for the tools arguments? F.ex. i want to add an tool to execute current script. Is there an help file available? I have downloaded PrimalPad-Silver.zip, there’s no CHM. Please use our free tools support forum for questions.